Rajasthan is a place blessed with rich and diverse culture. Its religious diversity, numerous fairs and festivals, and history from the time of the time of the Indus civilization onwards have shaped the culture of Rajasthan. While the culture of Rajasthan has a strong Rajput influence, Mughals too have left their mark. In Rajasthan the Desert State of India, fairs and festivals are celebrated with an unmatched fervor, and the vibrant folk music and dances that are a natural part of these celebrations attract every one. While some of the fairs are of a religious nature, like Gangaur, Teej, and Urs; some like the Nagaur fair and Pushkar fair revolve around cattle (camels), a vital part of life in Rajasthan; while some are purely for fun and entertainment e.g. 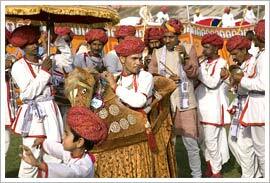 the Marwar festival, Kite festival and Elephant festival. To experience and enjoy the culture of Rajasthan, its arts and crafts and cuisines also must be sampled. Hindi is the primary language of the State, while four dialects of the Rajasthani language are spoken by the people here. Being a state whose economy is predominantly dependant on tourists, people speak and understand English, even in the far flung and rural areas. Tourist guides well versed with European and other languages are also available through your travel agent. Rajasthan is an ancient and historical land. Its heroic past and tales of its brave warriors are well known.